Insta Graphic Systems - Insta 929 Hands Free Label & Logo Press Insta's solution for high speed label application! 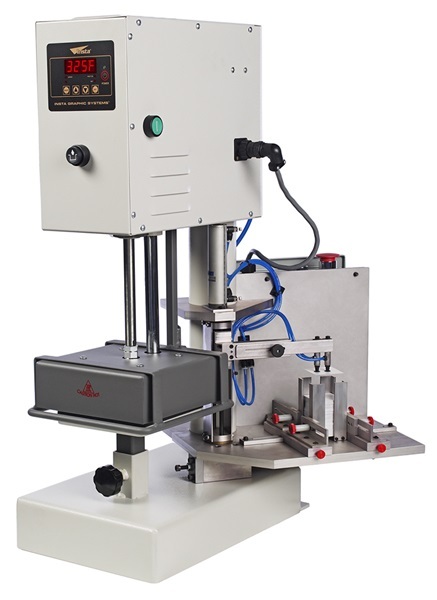 Insta 929 Hands Free Label & Logo Press Insta's solution for high speed label application! 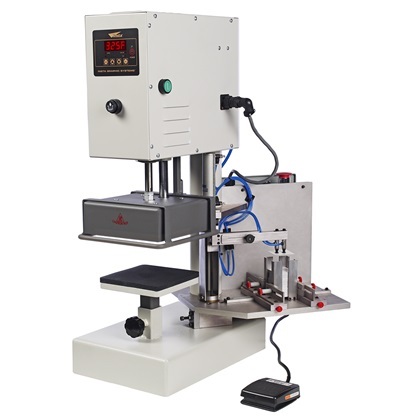 Insta answered the industry’s request for high speed label application with the Insta 929 Pic n’ Place heat press machine. 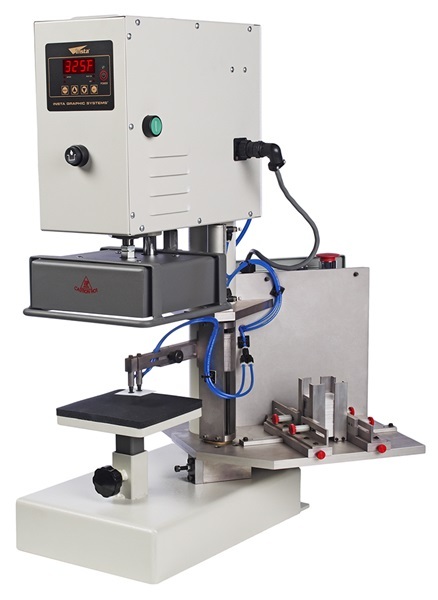 This pneumatic heat press is equipped with an automatic label placement device which has been specifically designed for the rapidly growing heat transfer label industry. 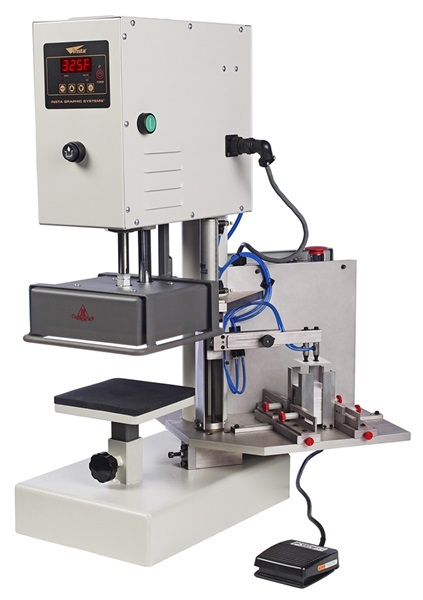 Its hands free, precision placement makes the Insta 929 the perfect label application machine. The Insta 929 is chosen for its automated high speed application capability, with an average throughput of 25 dozen per hour, and its ability to achieve consistent results under 24/7 use. The Insta 929 has been strategically designed to generate & evenly distribute tremendous pressure throughout the entire platen. And, it’s cast-in tubular heating element heats the metal from within, to produce constant and long lasting heat. A successful heat transfer application requires 3 key elements to work in tandem– time, temperature & pressure. The Insta 929 has mastered those elements and gets the job done every time. Built solid as a rock to endure 24 hour work cycles, seven days a week! Pic-n-Place Unit: Insta’s Pic n’ Place unit holds a stack of cut piece labels or logos in its hopper. When the machine is activated, the automated arm lifts a single label from the hopper, places it in a preset position on the platen and then the heated upper platen drops down to apply the transfer. The Pic n’ Place unit holds labels ranging in size from 1.5” x 1.5” to 4.5” x 4.5”. Hands Free Operation: The foot pedal attachment is an optional accessory that allows you operate the Insta 929 completely hands-free. When the foot pedal is activated, a label is picked up from the hopper, placed on the platen and then the heated platen is brought down to apply the transfer. Enhanced Productivity: The Insta 929 produces consistent results and reduces costly errors. Operators experience less stress, reduced fatigue and enhanced productivity. Best Return on Investment: Machines made from cast metal and considered to be of the highest quality. Insta’s 909 is strong enough to withstand heavy use without warping or bending. It is extremely durable and, if cared for properly, can last for many years to come. Get your best return on investment – buy an Insta!